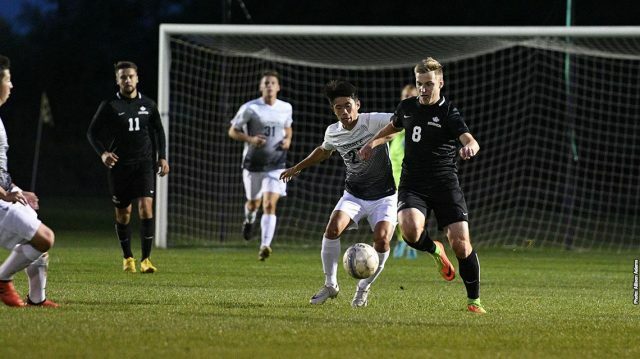 Both the men’s and women’s soccer teams opened up their conference seasons with a loss to Bethel College last Wednesday. The men’s team traveled to Morey Field in Mishawaka whilst the women hosted the Pilots at home. The men’s game consisted of four goals in the first half. The first came from Bethel 10 minutes into the game from the boot of Samuel Biek. Biek would strike again for Pilot’s, just 88 seconds later, to increase the lead to 2-0. Goshen was able to recover and get themselves on the scoreboard after an assist from Ollie Smith was put into the back of the net by Stuart Aeschliman. Aeschliman nearly got his second in the game just two minutes later after Goshen were awarded a penalty. The shot was saved by keeper Phillip Keller keeping the scoreline at 2-1 to the Pilots. Aeschliman was eventually able to get his second of the game. With 11 minutes and 46 seconds remaining on the clock, he struck the ball into the net to tie the game 2-2. The goal would be the last of the first half that saw the Pilots outshoot the Leafs 6-5. During the second half both teams created scoring opportunities, Goshen had four shots to Bethel’s three but neither were able to get the third goal. That was until the 70th minute when Biek was able to complete his hat-trick. The Maple Leafs found themselves behind once again. However this time, they were unable to find the equalizer. Instead, Bethel added an insurance goal in the 77th minute from Finn Luben. Senior goalkeeper, Johan Escalante, posted six saves and Aeschilman led the team with five shots. With Aeschliman’s two goals in the first half, he increased his total goals scored to eight through the teams first 10 games. With the loss, Goshen’s record falls to 5-5 overall and 0-1 in the conference. The women’s game kicked off an hour later at the John Ingold Athletic Complex. Bethel would control the pace of play and the possession of the ball for the majority of the first half. Goshen had a few opportunities at the beginning but were unable to get on the scoresheet. In the 39th minute Goshen would have a misplayed ball in their own territory. Bethel’s Megan Knoff was quick to react and stole the ball. She dribbled it into the 18 yard box where she then would drop it off to teammate Karma Hardy, who placed the ball in the back of the net. At the end of the half Goshen was outshot 12-4 and were 1-0 down. In the second half Goshen came out much more aggressive. They dominated in possession and outshot the Pilots 10-3. Goshen’s best opportunity came in the late minutes of the second half when Megan Bower received a cross inside the box form Mara Beck. Bower had only the keeper to beat but failed to place enough power on the ball which allowed Bethel’s Tessa Zimmerly to make the save. As the clock ran down, Bethel took the ball to the corners of the field at every opportunity to win the game 1-0. With the loss Goshen drops to 4-2-2 overall and 0-1 in conference play.